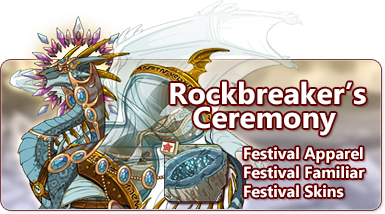 This month, all of dragonkind come together to celebrate the Rockbreaker's Ceremony. This festival celebrates the earth flight. Our most prized possessions, Deepearth Geodes, can be found by using any gathering profession in the earth territories this week. Neutral and earth-aligned monsters also have a chance to rarely yield these items as drops in the Coliseum. They may be crafted at Baldwin's Bubbling Brew using alchemy reagents. The Festive Favors holiday stall is now open for the duration of the holiday and you may trade in Deepearth Geodes for exclusive items. It will remain open until the holiday comes to a close on Sunday, December 2nd at 06:00 server time. These striking centaurs use their encyclopedic knowledge of deepearth stones, minerals, and jewels to get in the good graces of wealthy dragon clans, before robbing them blind. For the remaining duration of holiday, 12 of these skins will be stocking in the Treasure Marketplace and six of them can very rarely be gathered by digging in earth territories or by battling in the Coliseum. 2 of these skins will be exclusive to Baldwin's Bubbling Brew. Rockbreaker's Ceremony 2018. (1/14) Designed by Kaldwin. Rockbreaker's Ceremony 2018. (2/14) Designed by Tiguidou. Rockbreaker's Ceremony 2018. (3/14) Designed by houseteeth. Rockbreaker's Ceremony 2018. (4/14) Designed by corprus. Rockbreaker's Ceremony 2018. (5/14) Designed by Autopilot. Rockbreaker's Ceremony 2018. (7/14) Designed by Gouldiae. Rockbreaker's Ceremony 2018. (8/14) Designed by ferpitou. Rockbreaker's Ceremony 2018. (9/14) Designed by SepiaSenpai. Rockbreaker's Ceremony 2018. (10/14) Designed by FelixEgadrik. Rockbreaker's Ceremony 2018. (11/14) Designed by FunkEngine. Rockbreaker's Ceremony 2018. (12/14) Designed by razrroth. Rockbreaker's Ceremony 2018. (13/14) Designed by Grovey. Rockbreaker's Ceremony 2018. (14/14) Designed by Lokenosse. I hope everyone has a smashing Rockbreaker's Ceremony! Congrats to the winners and honourable mentions of the skin/accent contest.